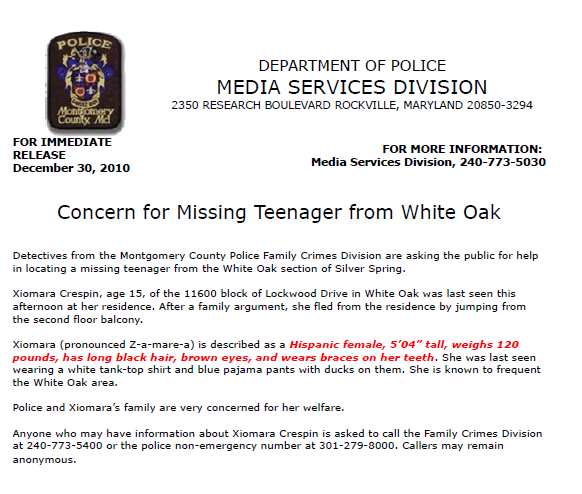 Montgomery County Police are searching for a missing 15-year old girl from White Oak, MD. As always, we want our readers to have access to the original information. The unabridged press release from the police department is displayed below. Xiomara Crespin was last seen on the afternoon of December 30. Please follow the instructions in the press release if you have any information on her whereabouts. Police received a call at approximately 10:29am this morning regarding an incident at Suburban Hospital in Maryland. Upon further investigation it was learned that a 40-year old male employee of the hospital had been assaulted and sustained "upper body trauma." Due to the nature of the incident, police and hospital officials locked down Suburban Hospital until around 2:30pm this afternoon. At this time, police are not releasing the name of the victim. Officials insisted that all patients and staff were safe during the lockdown. The Capital Region Pulse will have more on this story as it continues to develop.